Poway -- You might say Woody Norris is waiting for his chip to come in. Nine years ago, the Poway inventor founded Patriot Scientific to develop his idea for a ground-penetrating radar that could be used to identify subterranean features from an aircraft. Theoretically, such a radar could be used to search for everything from deep-underground oil fields and mineral deposits to buried structures, utilities and even land mines just beneath the surface. Now a proprietary microprocessor that Patriot acquired for its radar two years ago could take the little start-up company in a whole new direction. Norris, 57, says the high-speed micro-processor--named "ShBoom" after a 1954 jukebox tune--is perfect for running Java, an innovative programming language for the Internet designed by Sun Microsystems. "The chip fits with Java like this," Norris says, holding aloft his hands with fingers dovetailed. On Wall Street, investors have likewise embraced the idea. On May 17, the price of stock in Patriot Scientific hit a record $4.03 per share on the Nasdaq electronic exchange--almost 26 times its year-ago price of 15 cents per share. Last week, the stock hovered at about $3 trading on an average volume of roughly 230,000 shares a day. Yet, the ShBoom processor's compatibility with Java was completely unforeseen--and unintended. "One of my partners would refer to this as 'a bluebird,'" says Willis E. Higgins, a Palo Alto patent attorney who represents Patriot. "It's something that just comes along. A stroke of luck." The ShBoom processor was conceived more than a decade ago by Charles Moore, who invented the "Fourth" programming language for computers, and Russell H. Fish III, a computer consultant and chip designer. After years of working on the project, Fish and Moore sold all rights to the ShBoom processor to the late Helmut Falk, a Romanian-born engineer who co-founded DH Technology, a high-technology printer manufacturer now based in San Diego. 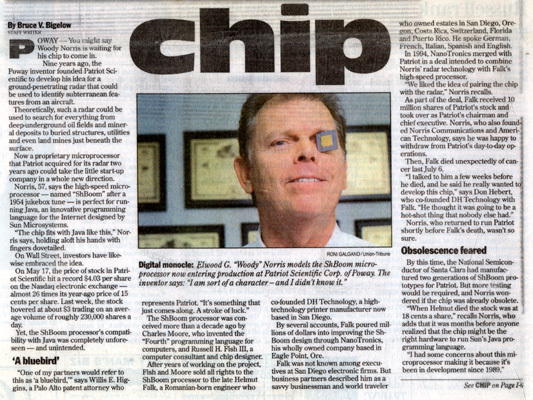 By several accounts, Falk poured millions of dollars into improving the ShBoom design through NanoTronics, his wholly owned company based in Eagle Point, Ore.
Falk was not known among executives at San Diego electronic firms. But business partners described him as a savvy businessman and world traveler who owned estates in San Diego, Oregon, Costa Rica, Switzerland, Florida and Puerto Rico. He spoke German, French, Italian, Spanish and English. 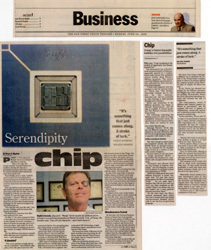 In 1994, NanoTronics merged with Patriot in a deal intended to combine Norris' radar technology with Falk's high-speed processor. "We liked the idea of pairing the chip with the radar," Norris recalls. As part of the deal, Falk received 10 million shares of Patriot's stock and took over as Patriot's chairman and chief executive. Norris, who also founded Norris Communications and American Technology, says he was happy to withdraw from Patriot's day-to-day operations. Then, Falk died unexpectedly of cancer last July 6. "I talked to him a few weeks before he died, and he said he really wanted to develop this chip," says Don Hebert, who co-founded DH Technology with Falk. "He thought it was going to be a hot-shot thing that nobody else had." Norris, who returned to run Patriot shortly before Falk's death, wasn't so sure. By this time, the National Semiconductor of Santa Clara had manufactured two generations of ShBoom prototypes for Patriot. But more testing would be required, and Norris wondered if the chip was already obsolete. "When Helmut died the stock was at 18 cents a share," recalls Norris, who adds that it was months before anyone realized that the chip might be the right hardware to run Sun's Java programming language. "I had some concerns about this microprocessor making it because it's been in development since 1989," Willis says. "I was wondering if the window of opportunity had already bypassed us." The phenomenal rise of Patriot's stock occurred mostly in February, apparently spurred by a London-based trade journal that published several articles about Patriot's ShBoom processor. The stories noted that ShBoom seemed particularly well-suited for Sun's new programming language. Norris says production of the ShBoom processor has begun at National Semiconductor, and the chip is available in limited quantities. Yet, Patriot's fortunes are far from certain. The technology underlying the ShBoom processor relies on a long-established integrated circuit design known as stack-based architecture, which was shelved by most chip makers decades ago. Although Patriot's 32-bit chip can run different programs, it was tailored to run most efficiently with the Fourth programming language, a computer code similar to Java. The chip's design is unlike standard integrated circuits, like Intel's 80X86 series of micoprocessors, that are intended for the broadest range of uses by a variety of computer system designers. Several experts in microprocessor design questioned whether a specialized chip designed for a particular code can gain market acceptance. "Processors and software don't win just because of superior technology," says Joe Pasquale, an associate professor of computer science and engineering at UCSD. While the fundamental idea of the ShBoom processor is sound, Pasquale says: "It's just that you're going against the flow of technology trends...Do you really want a machine that will run Java well, but won't run other programs as efficiently? There's no reason why you just couldn't put a more general-purpose processor there." On the other hand, Sun Microsystems announced plans earlier this year to launch three specialized microprocessors designed specifically to run the Java programming language. Of course, Sun's plans could pose a different set of problems for Patriot if the Poway-based company seeks to enforce its patents against the computer goliath, which reported sales of roughly $6 billion last year. So far, Patriot has obtained two patents for the ShBoom processor and Higgins says other applications are pending. Nevertheless, Patriot has never generated operating revenues and currently has only 13 employees. One trade-industry review of ShBoom said "industry support for Patriot is non-existent" and the company will have to depend on "adventurous, resourceful customers" to develop products that incorporate its unusual chip. In the meantime, Norris says he is eager to license Patriot's technology to others, and the company has been negotiating with a number of companies. He says the company also hopes to forge alliances with its customers and to use the ShBoom chip in its ground-penetrating radar and other products developed by Patriot. "Anyone who wants to use Java in their product is going to at least look at our chip," Norris says. Patriot appears likely to earn its first profit in fiscal 1997, says John C. Raaf, an analyst for the Oregon-based Red Chip Review. Since its initial public offering in 1989, the company has financed its operations through additional stock offerings and now has about 26 million shares outstanding. The company is free of debt. Yet with so much stock outstanding, Raaf says, "If they finally become profitable, it could take some time before investors finally see it reflected in the share price." Meanwhile, Patriot insiders have seen astronomical gains in their share price. Documents filed with the Securities and Exchange Commission show that Norris owns 5 million shares of Patriot's common stock, issued at par value of one-thousandth of a penny per share. As Norris puts it: "We've got no complaints at this end." Digital monocle: Elwood G. "Woody" Norris models the ShBoom microprocessor now entering production at Patriot Scientific Corp. of Poway. The inventor says: "I am sort of a character--and I didn't know it."